Glass remains by far the most popular packaging format for wine, with 85% of the market. The highest consumer acceptance is for glass with cork closure. 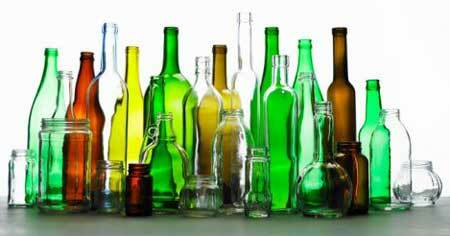 Glass was first used as a packaging option in the first century BC, but the technology was tightly guarded. It first came to be used as a popular wine packaging material in the mid-1800s once the process of blowing a bottle was automated-- until then, there was too much bottle variation for it to be effective as a packaging option for most wineries. The raw materials of glass are: silica sand, sodium oxide (soda ash), calcium oxide (limestone), dolomite and feldspar, which are blended according to a precise recipe. Other metal oxides, which confer different colors to the final product, may be incorporated into the recipe in minute amounts. These raw materials are mixed together with about 25-30% cullet (broken glass), to lower the melting point of the entire mixture before it is fed into a furnace, blow molded, and annealed. The 750-mL bottle is the most typical size. Glass is an impermeable and inert container— important for holding a product that relies entirely on its sensory profile. From a producer’s standpoint, there are two major decisions to be made with regard to wine quality when wine is packaged in glass. The first is the color of the glass; many wines will undergo chemical changes from exposure to UV rays. Certain whites (such as Pinot Grigio) can smell and taste “skunky,” and red wines can experience bleaching of their anthocyanins. For these wines, darker glass affords more protection. Unfortunately, glass is a somewhat fragile package, and improper handling can lead to breakage. This is a downside for producers, retailers, and customers alike. A breakage event can impact more than just the bottles that have broken—seepage may destroy labels on undamaged bottles, diminishing salability. Additionally, broken glass is a safety hazard. Bottles are also weighty, which limits the volume that can be transported at one time. Trucks are limited on load weight, and can only carry around 1,200 cases, even accounting for variations in bottle weight. Rail containers can hold three to four times that. Add to this that a case is not a particularly compact package, with about half the box comprising empty space, and the efficiency of moving glass-packaged wine is greatly diminished. From an environmental standpoint, the weight of the glass, plus the fuel required to move it can more than double the carbon footprint of the product— something that matters to many consumers in an age of increasing attention to climate change.